Itemis-glen-1717 - Aerial view of Greyhound Bus terminal building looking towards downtown city centre, Calgary, Alberta. Itemis-glen-1718 - Aerial view of Mount Allan (Nakiska) in Kananaskis area, Alberta. Itemis-glen-1719 - Aerial view of Olympic Oval construction site, Calgary, Alberta. Itemis-glen-1720 - Aerial view of site of future Nordic Centre and cross-country skiing trails, Canmore, Alberta. Itemis-glen-1721 - Aerial view of site of Nordic Centre and cross-country skiing trails, Canmore, Alberta. Itemis-glen-1722 - Aerial view of site of Nordic Centre cross-country skiing trails, Canmore, Alberta. Itemis-glen-1723 - Aerial view of Kananaskis golf course and Mount Allan (Nakiska), Kananaskis area, Alberta. Itemis-glen-1724 - Aerial view of cement plant at Exshaw, Alberta. Itemis-glen-1725 - Aerial view of Banff, Alberta. 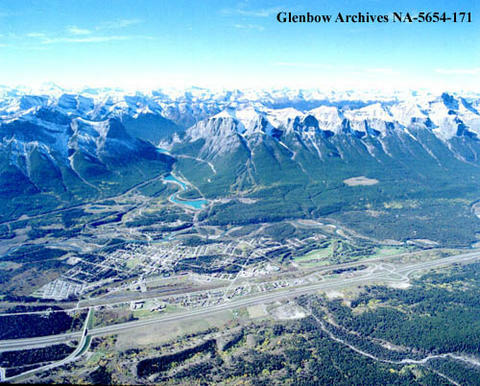 Item is-glen-1721 - Aerial view of site of Nordic Centre and cross-country skiing trails, Canmore, Alberta. Aerial view of site of Nordic Centre and cross-country skiing trails, Canmore, Alberta.